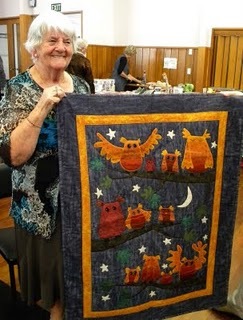 Anne Scott is the publisher of New Zealand Quilter magazine and the owner of Minerva in Wellington. 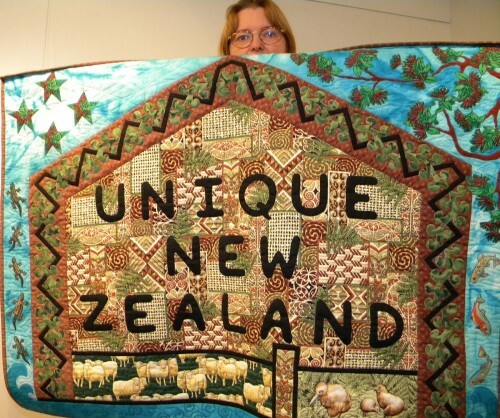 Here, Ann shows off one of her quilts, that was part of the traveling exhibit, “Made in New Zealand”. 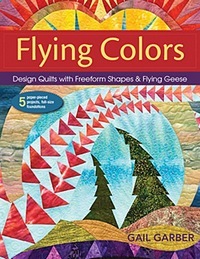 Anne’s shop has tons of quilting and fiber books as well as a gallery with rotating displays. 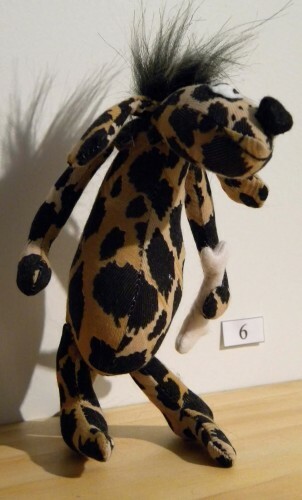 Minerva had a doll exhibit during our visit, big ones, tall ones, short ones, small ones. But, this is the little fellow who stole my heart! 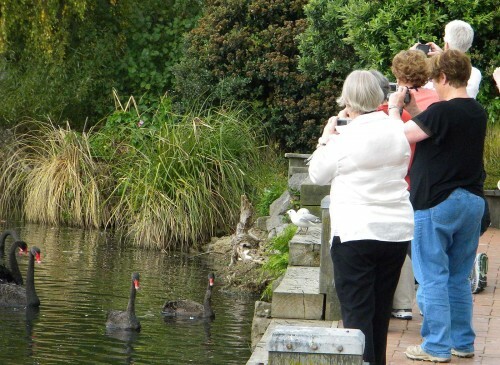 Since the tour was now well-indoctrinated into my passion for all things feathered, they were pretty darned excited to see and photograph the black birds. 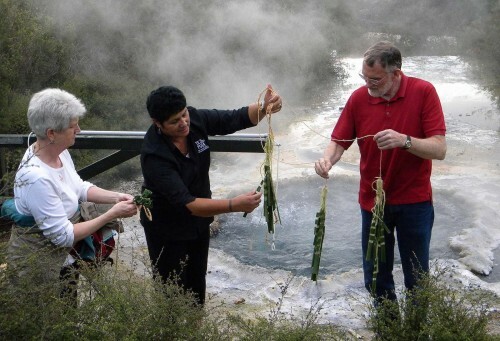 Te Puia is the heart of the Maori Cultural World. 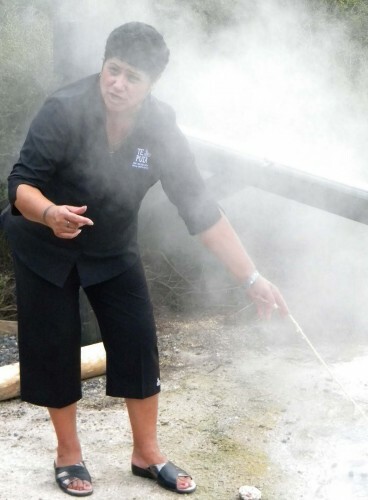 Their mission is to be the centre of knowledge and excellence for the preservation, presentation, education and growth of traditional expressions of Māori arts, crafts and culture. 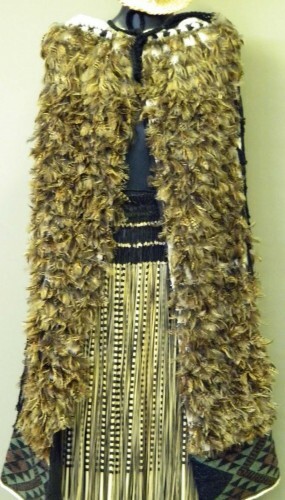 This woven flax garment is simply incredible. 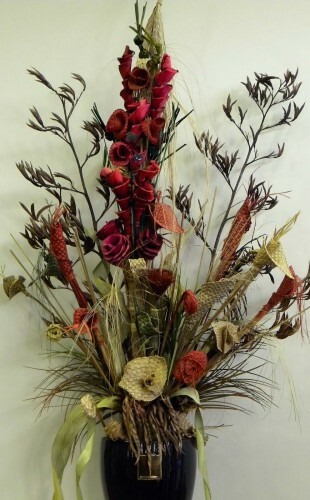 Their gallery features some incredible weavings, all done from flax leaves, including the floral arrangement. 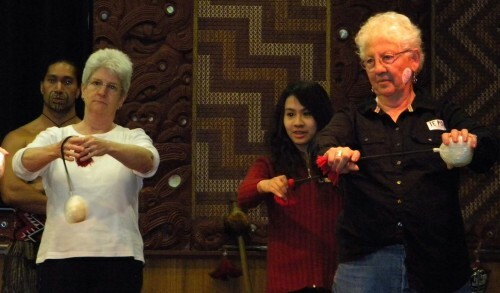 We took a weaving class, so we too could learn this art form. Looks pretty easy in this picture, where our teacher, Teresa Murray, whipped out this sample in no time at all! 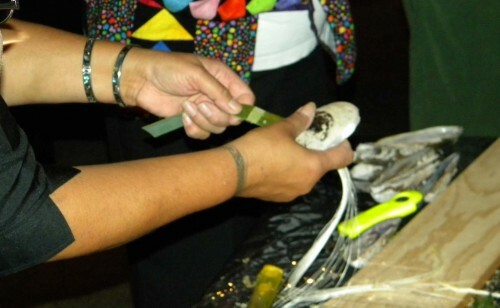 Teresa showed us how to score the flax leaf and then use a paua shell to remove the fiber. Once the fiber was removed, the remaining strands were rolled along the leg to form a twisted rope. 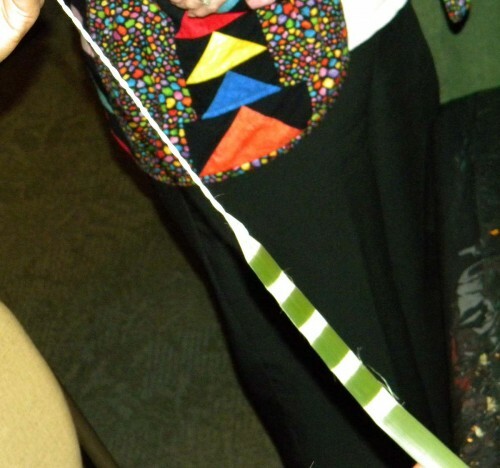 It takes hundreds of these strands to make each grass skirt. Our team got started! 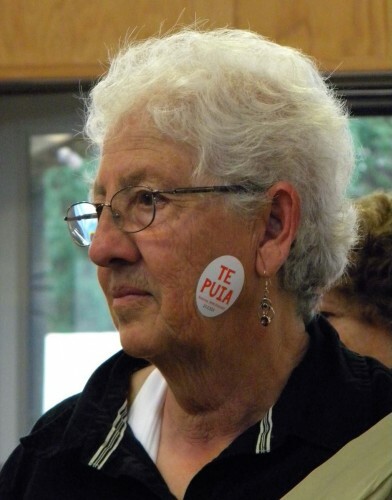 It is not nearly as easy as Teresa made it appear. In fact, I toiled for two hours, inadvertently destroyed several flax leaves and, finally managed to get two strands done. 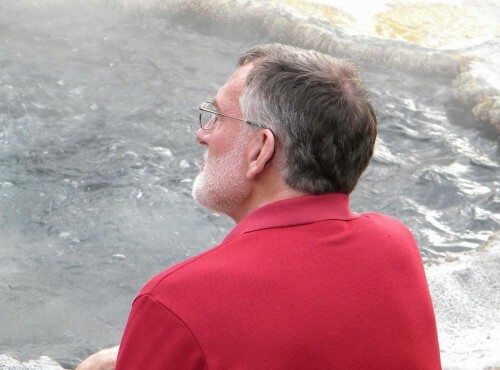 Next, we all went down to the boiling pool, to boil our flax. Teresa showed us how it was done. Dave was one of her helpers. Karen, a New Mexico native, was the other helper. Here they are removing the boiled flax. This is the collective work of 18 students! The lesson that I learned here is that if you ever want to own a grass skirt, just pay whatever the asking price is! It will be worth it! Flax weavings hang beneath the roof along the walkway at Te Puia. We saw this ancient Chief’s cloak and woven skirt in the gallery too. 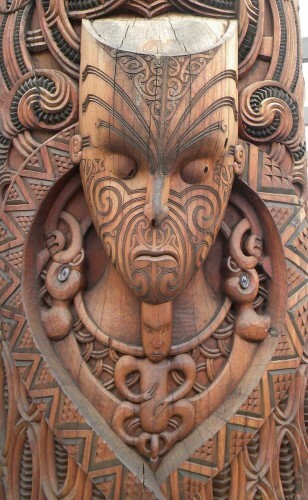 It would have been used by a Maori chief and was adorned with real Kiwi feathers. 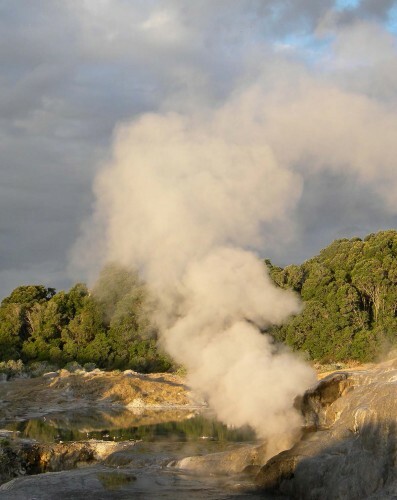 Our hotel was located at the southernmost end of Lake Rotorua, in an area known as sulphur flats. (read stinky). 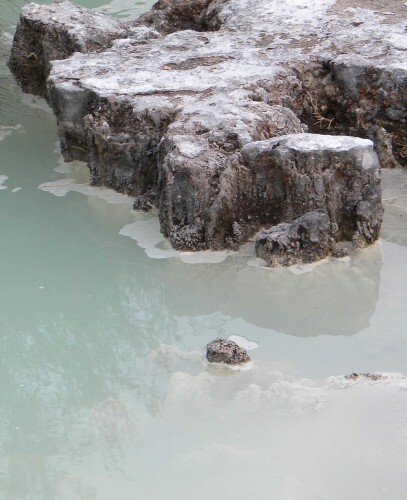 But once you got used to the aroma of rotten eggs, the birding was rather good! The inland lake has a good population of Black-billed Gulls, a species that frequents inland lakes and is the most threatened gull species in New Zealand. Good numbers of Pukeko were present foraging among the gulls. Check out this funky PukekoMania blog with lots of humorous images and not so funny hazards. 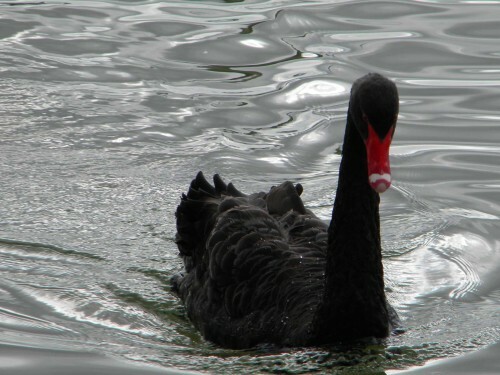 We saw Pukeko in wetlands throughout New Zealand, a truly gorgeous blue rail with a bright red bill, and legs. 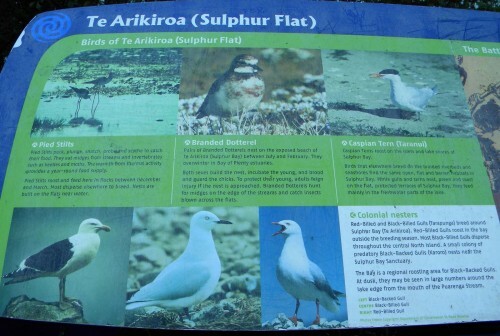 Sulphur Flat is home to many endemic species, including New Zealand Dotterel, White-fronted Tern, and Black-backed Gull. At Rainbow Springs, we visited a Kiwi breeding facility where eggs are removed from nests located in the wild, hatched and reared in captivity, and then released near their nest sites when they are large enough enough to defend themselves from stoats, rats, cats, and possums. 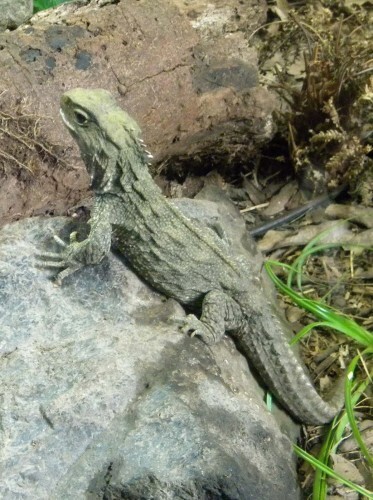 We also got to see the native Tuatara, the ancient reptile, unique to New Zealand. 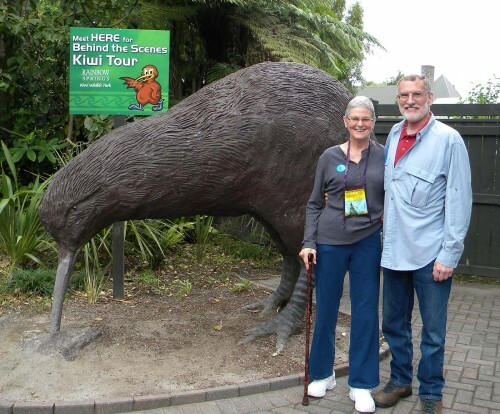 Dave and Betty, who hail from Wisconsin, posed in front of the giant kiwi at the park. 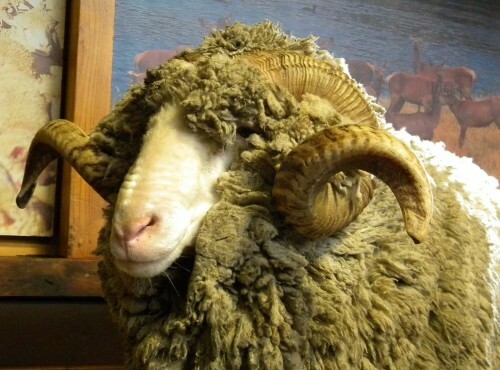 Meet Mr. Merino, one of the most desired breeds for the production of wool. New Zealand is renowned for its sheep and the working dogs that are part of the team. 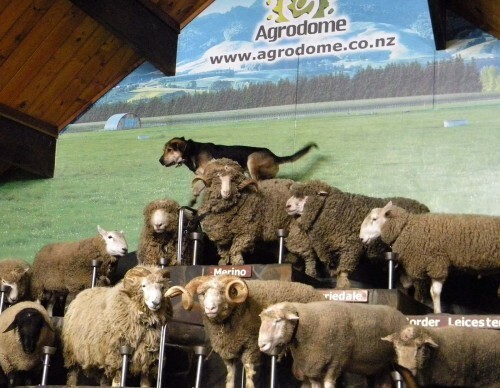 At the Agrodome, in Rotorua, we watched a demonstration of the different breeds of sheep and the different kinds of dogs that are used for herding. 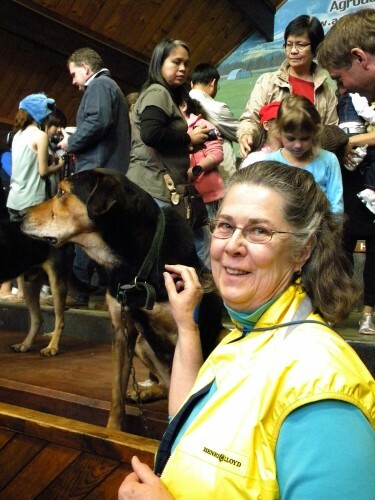 The show was entertaining and educational with hilarious parts, such as when a dog was herding ducks, and the audience was invited up to help milk cows and bottle feed lambs. Lenelle, the Australian on our tour, enjoyed the photo opp. 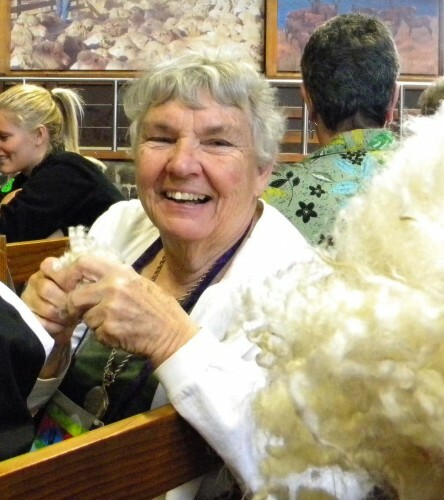 Judy, a proud octogenarian, handles the just-sheared wool. And, Cora, who LOVES dogs, got a chance to pose with her handsome new friend. Cora missed her new puppy who stayed home in California, under the care of her hubby. 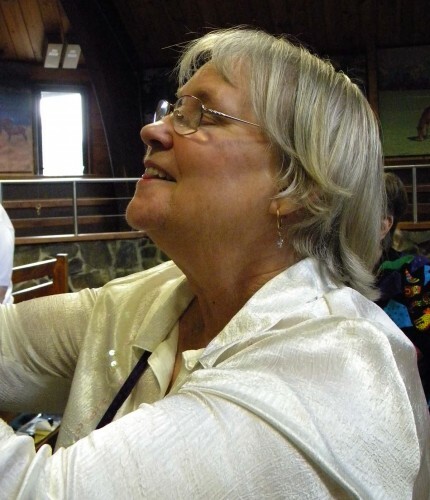 That afternoon, we visited the Hamilton Quilter’s for their monthly meeting, featuring Daphne Phillips, an octogenarian, and one of the most prolific quilters ever! 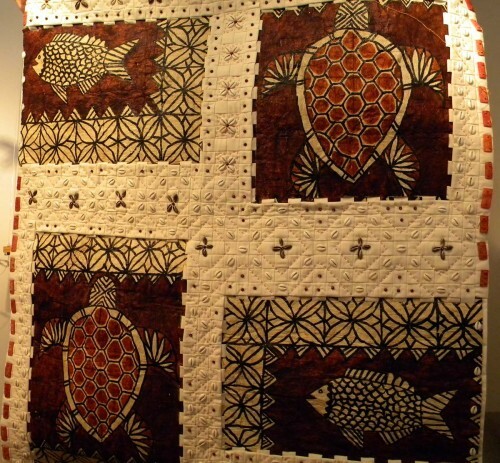 Daphne shared many of the quilts she had made over the course of her quilting career. 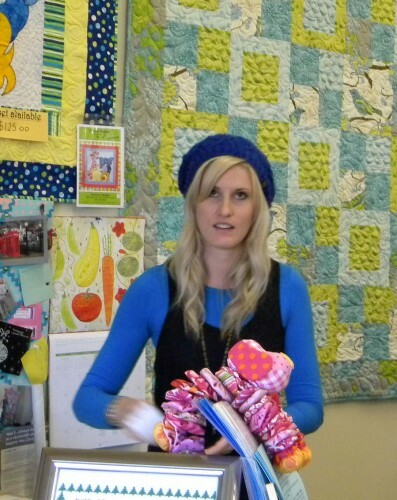 Most inspiring was her ‘can do’ attitude, not to mention all of the quilts she had made. Ellen (in the flying goose jacket) checks out some of Daphne’s handiwork. The next morning we visited Donna’s Quilt Studio. 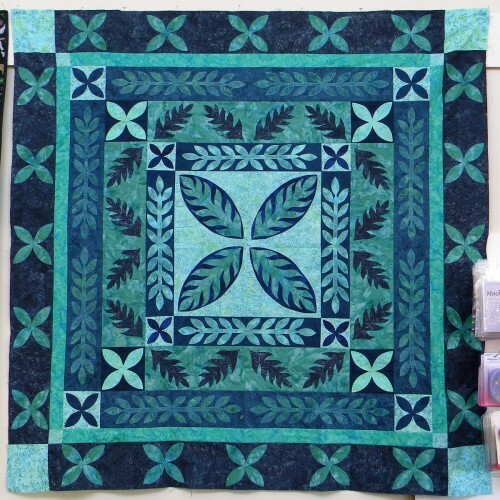 Noted for her funky quilt fabrics, friendly staff, and fun quilting classes, Donna specializes in contemporary fabrics and original designs. Donna, and daughter Ashleigh are the go-to girls for the “something different” you’ve been trying to find. Here, Ashleigh helps ring up sales for our group! One of the interesting phenomenons about our tour was when the group of 18 quilterly types, excluding Mike and Dave, descended en masse on a quilt shop.